Our combination project in Lago Vista, TX, turns up the heat with outdoor living possibilities! This covered patio space was the first phase of the addition. Archadeck of Austin recently completed the final stage of this dual-phased outdoor living combination project in Lago Vista, TX. 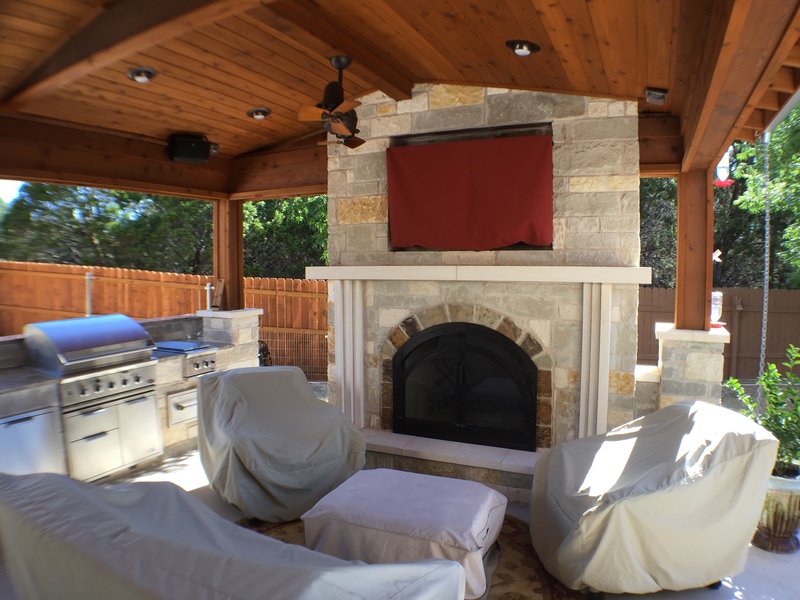 The completed masterpiece includes a patio cover which serves as an outdoor living room for these homeowners complete with a custom natural stone fireplace and hearth. Within the covered patio we also created a well-stocked outdoor kitchen which houses an egg smoker, grill and refrigerator among other amenities. 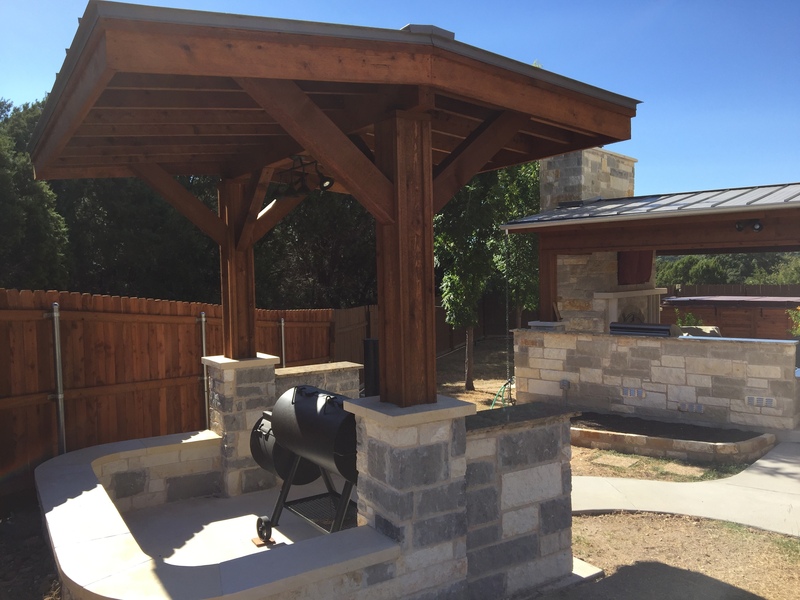 Just a stones throw away from the covered patio is the pergola-style protected shade structure designed to house the family’s beloved smoker that has been handed down generation to generation. The area includes an integrated park-bench inspired seating wall perfect for teaching the subtle innuendos of perfecting the art of smoking meats. The addition of the separate smoker space came about after the homeowner moved the existing perimeter fence out to accommodate the anticipated design in 2014. This image shows both phases of the addition completed. Although, outdoor food preparation and outdoor dining is high on the homeowners list of favorite things, they also have a soft spot for natural and native materials. This is evident throughout the space in their choice of materials. 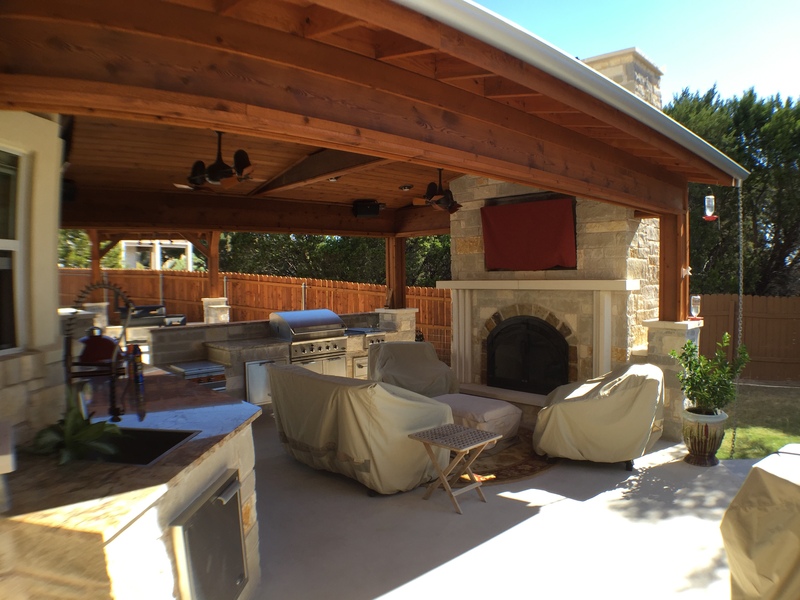 Archadeck of Austin perfected the design of both outdoor living additions to compliment the rustic wood used in conjunction with natural stone. 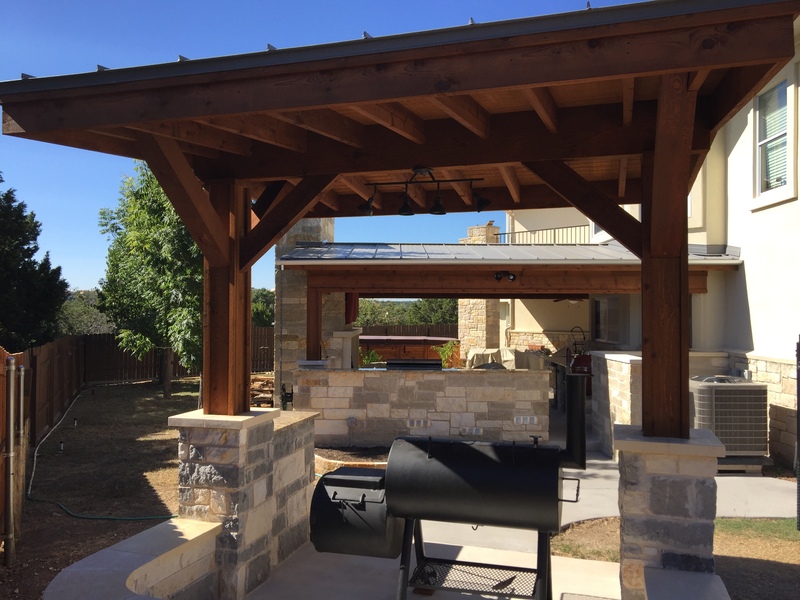 The materials used within the patio cover consists of a tongue and groove cedar ceiling with posts and beams, including engineered beams, wrapped in cedar and stone. The spacious fireplace within the space is crafted from a combination of sandstone, limestone and Leuders stone. In the outdoor kitchen area we continued the use of Leuders stone and topped the kitchen area off with a beautiful natural granite countertop. We continued the materials used in the covered patio, (phase one of the project), into the pergola-style covered space designed for the homeowner’s smoker. Here, we also used cedar and natural stone throughout. View of Lago Vista outdoor kitchen. 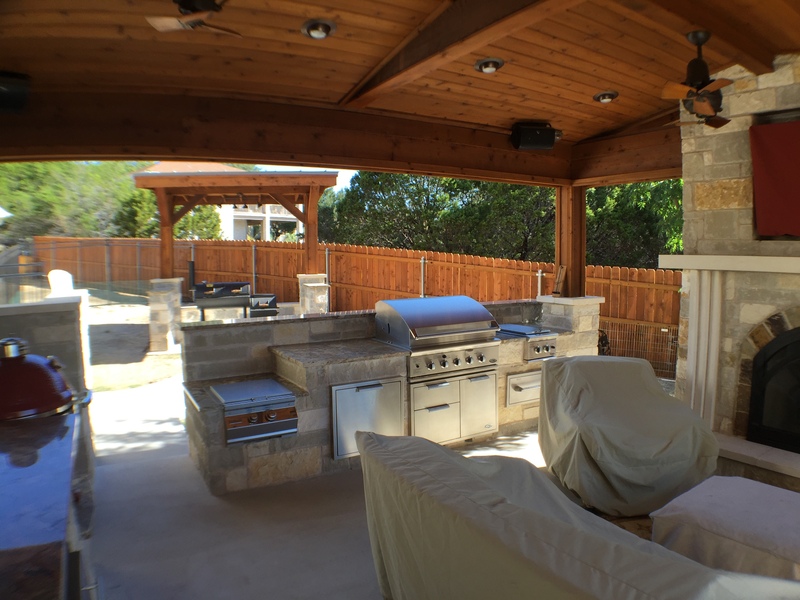 The finished outdoor living combination is a raving success with these Lago Vista homeowners. They now have a backyard retreat that is overflowing with possibilities. From relaxing by the fireplace after a long day to turning up the heat and enjoying a feast from one of two food preparation locales within the space. If you are ready to learn more about creating a space with endless outdoor living potential too, contact Archadeck of Austin to schedule a consultation today. You can reach us at (512) 259 – 8282 or via email at jim.odom@archadeck.net. This entry was posted on November 16, 2015 by austinporchandpatio. It was filed under Archadeck of Austin, Austin outdoor kitchen, Austin patio cover, Built-ins, Covered patio Austin, Limestone, Natural stone outdoor structures, Outdoor fire place and was tagged with Archadeck of Austin, Archadeck of Austin design, Austin covered patio, austin outdoor fireplace, Austin outdoor room, Austin patio builder, Lago Vista TX outdoor fireplaces, Lago Vista TX outdoor kitchens, Lago Vista TX patio builder, Lago Vista TX patio cover, Lago Vista TX pergola-style covered patio, Lago Vista TX stone outdoor living spaces, Unique patio designs Austin TX.